The World of Tanks trailer creation department must have the easiest job in the world. It doesn't matter what news they're asked to promote, they can just illustrate it with exciting cuts of footage showing tanks blowing each other up. New tanks? Show tanks! Overhauled maps? Show more tanks! A large-scale overhaul of the game's economy, allowing players to purchase premium consumables with in-game credits? Keep showing tanks! Previously, the premium consumables - one-time use items, such as medkits and repair kits - were only available to purchase using Gold, World of Tanks' real-money currency. With the now released 8.5 update, they're accessible through in-game credits too, with the exchange rate matching that used for premium shells. And there's another bonus for non-paying players: they can now create tank companies and three-player platoons. The update also brings the usual selection of new tanks, maps and upgrades. It's the German and Soviet tech trees being updated this time. The Germans get a selection of medium hardware, including the Tier X Leopard 1, while the USSR get new light tanks to play with. Pearl River is the new location - an Asia-set map that Wargaming.net promise will "please lovers of irregular landscapes everywhere." In addition, Redshire, El-Halluf, Karelia, Prohorovka and Sand River have all been given a visual and balance polish. 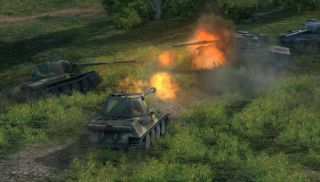 World of Tanks 8.5 Update is available now. If you love WoT, or you're just getting into it, check out PC Gamer Presents World of Tanks , a definitive 148 page guide to the game that includes bonus codes for 1500 in-game gold for existing accounts and 250 gold, a premium tank and an extra garage slot for newbies.